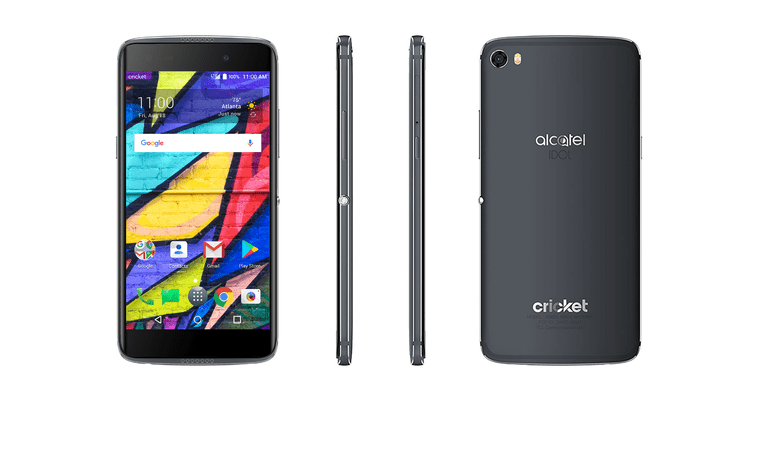 Alcatel's OneTouch series of smartphones are flagship devices that are available unlocked in the U.S. from prepaid carrier Cricket Wireless. The phones run a clean version of Android, though there are some carrier apps bundled in. While the devices are less expensive than flagship phones from Samsung and Google, they don't look cheap and perform nearly as well. Alcatel's other Android phones, including the 1 series are a mix of entry-level and mid-range devices. Here's a look at the latest Alcatel OneTouch phones. Alcatel One Touch Idol 5. Alcatel OneTouch Idol 4 and VR headset. The OneTouch Idol 4 smartphone comes with a VR headset, Alcatel's UNI360 Goggles. However, the smartphone can't render virtual reality video very well, resulting in a blurry experience most of the time. The phone also has a customizable button called a Boom key that can open a weather widget or open or trigger the camera. It has a glass and metal construction compared to the Idol 3's plastic body and also features a version of Android that's close to stock. However, its battery doesn't last as long as the Idol 3's—though it thankfully supports fast charging. The Idol 4 has only 16 GB of onboard storage, but you can supplement that with a memory card. Alcatel One Touch Idol 3. The OneTouch Idol 3 was Alcatel's first flagship device sold in the U.S.; the company previously only offered entry-level models. It has premium-level features, including a high-resolution screen, powerful built-in speakers, and a near-pure version of Android. The phone has only 16 GB of storage, but you can expand that with a memory card. The Idol 3 has a plastic body, a decent battery, and the occasional hiccup in performance, but it's otherwise a great device.